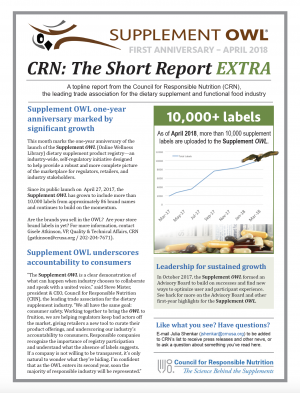 Washington, D.C., April 24, 2018— This month marks the one-year anniversary of the launch of the Supplement OWL (Online Wellness Library), the dietary supplement product registry, giving the dietary supplement industry the opportunity to reflect on the power of unity and proactive self-regulation. Launched April 27, 2017, the Supplement OWL is an industry-wide, self-regulatory initiative designed to provide a robust and more complete picture of the marketplace for regulators, retailers, and industry stakeholders. 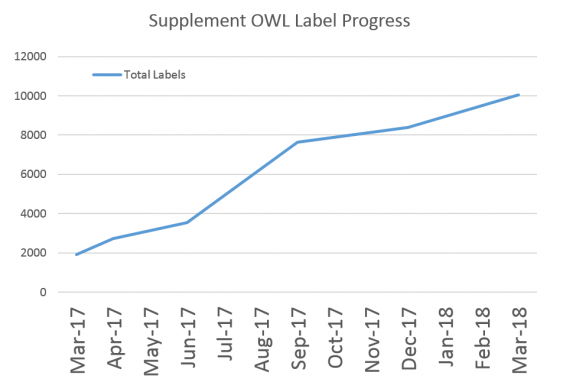 Today, with over 10,000 labels and growing, the Supplement OWL it is doing just that. The registry’s microsite, www.SupplementOWL.org, launches with ten companies beta-testing the technology platform. Starting April 23, CRN will be disseminating messaging about the importance of the Supplement OWL and self-regulation as a whole. This week-long effort is designed to recognize companies who have participated in the Supplement OWL, to encourage more companies to upload their finished product labels, and to generate public dialogue around the value of self-regulation. 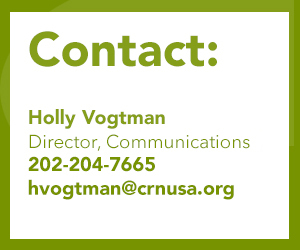 In tandem with the Supplement OWL’s one-year anniversary, CRN (@CRN_Supplements) will host an industry-wide Twitter chat to celebrate the power of self-regulation in the dietary supplement industry. The one hour chat will begin at 3pm ET on April 26, and all stakeholders are welcome to join the conversation using #SelfRegChat.